Interested in enrolling in our year-round Foundations Program? Fill out and send us an Enrollment Inquiry. Wondering if we're open today? View our complete calendar including all closures. Wondering how we handle absences and make-ups? Please view our make-up policy. We are always looking for ways to improve our program. If you have any feedback about our site or questions about ArtWorks we would love to hear from you. Please note that we do not accept information about attendance via email. All information regarding attendance must be called in to our office. We are between 14th and 15th Avenues, just off of 19th Avenue and Sloat Blvd. in the West Portal commercial district. 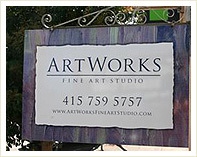 We are easily accessible from the south by the I-280 FWY, and from the north by HWY 1. We are located on a MUNI line, just 3 short blocks from West Portal Station. There is ample FREE 2- hour parking on neighboring streets. The West Portal commercial district offers 3 blocks of metered parking.